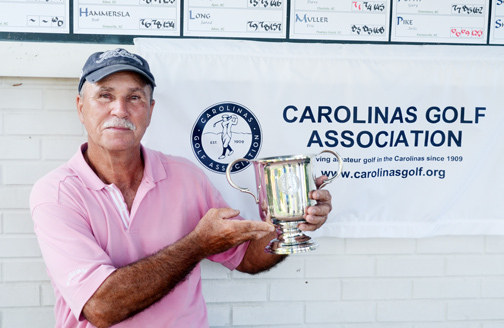 Arlis Pike of Kernersville won his third straight CGA Super-Senior title. Three-Peats seem to be the thing in the Carolinas Golf Association these days. Arlis Pike of Kernersville, NC won his third straight CGA Super-Senior championship with a victory at The Country Club of Spartanburg. Pike joins UNC golfer Carter Jenkins who won his third straight Carolinas Amateur earlier in July. Pike opened the 36 hole event with a 6-under par round of 66 to trail Rick Luzar of Pinehurst by a shot. In the second round the two golfers played each other just about even in what looked like a match play round. Pike avoided a big problem when he was able to escape an almost certain bogey on the par 3, 14th hole. The defending champion had hit his tee shot over the green and had a difficult up and down to make par. “I looked at what I had and thought if I could make that up and down I could go on and win the tournament,” said Pike. His second shot rolled within gimmie range of the hole and he escaped a bogey and kept a share of the lead. The tournament would be decided on the always pivotal 17th hole at Spartanburg. The par-5 hole has determined the outcome of many tournaments at the club. Pike hit his second shot on the green and had a good chance at an eagle. Luzar came close to getting his second shot on the green, but it came up short in a green side bunker. “I didn’t get the eagle, but the birdie gave me a one shot lead going to the last hole,” said Pike. With a one shot lead Pike was able to play safe while Luxar had to try for a birdie to tie. He finished with a bogey and Pike earned his third straight win, this one by two shots. “To win one of these is pretty good, to win three is just great,” said the champion. “I missed some shots, but I got the ones I needed to win,” Pike said. The three time champion has won his titles at Hilton Head National, High Meadows and now The Country Club of Spartanburg. “This was just a great course for this tournament. It was the right length and it fit the competitors. For us guys over 65, we can’t play the 7,000 yard courses anymore so the way Spartanburg was set up made for a very good tournament,” said Pike. The winner carded rounds of 66 and 69 for a 135 total. Luzar followed up his opening rond 65 with a 72 for a 137 total. Robert Desjardins of Matthews, NC was third at 139. The top golfer from the Upstate area was Lynn Martin of Travelers Rest who tied for sixth. Wayne Rogers of Easley was 20th.